Ever wonder what over a century’s worth of fine tobacco experience tastes like? Well, wonder no more. La Aurora Maduro cigars follow in the grand tradition of excellence established by brand founder Eduardo Leo Jimenes in 1903 with a rich and riveting profile that never fails to satisfy. 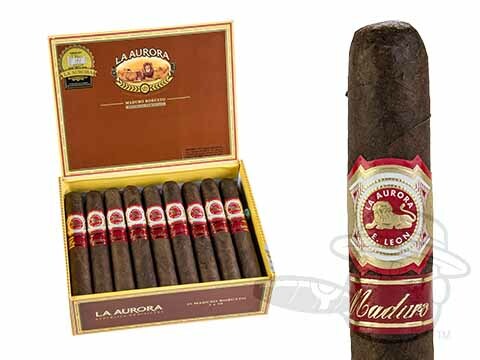 Medium in body, but undeniable chock-full of flavor, the La Aurora Maduro gets its decadent character from a dark Brazilian wrapper blanketing a dense mix of Brazilian, Dominican and Cameroon long leaves. The resulting taste is one for the record books; boasting big, bold tones of smooth cedar, unsweetened chocolate, peppery spice, and slight nuttiness through an easy draw. Handmade in Santiago, like all La Aurora cigars have been for over 115 years, the medium-bodied La Aurora Maduro brings you fine flavor and unerring consistency at an amazing price. Grab your batch now.